Wael Ghonim Makes 'Time' Magazine's Latest 100 Most Influential People List : The Two-Way The young Egyptian became for many the face of the protests that toppled President Hosni Mubarak's regime. Others on Time's list include WikiLeaks founder Julian Assange and Tiger Mother author Amy Chua. 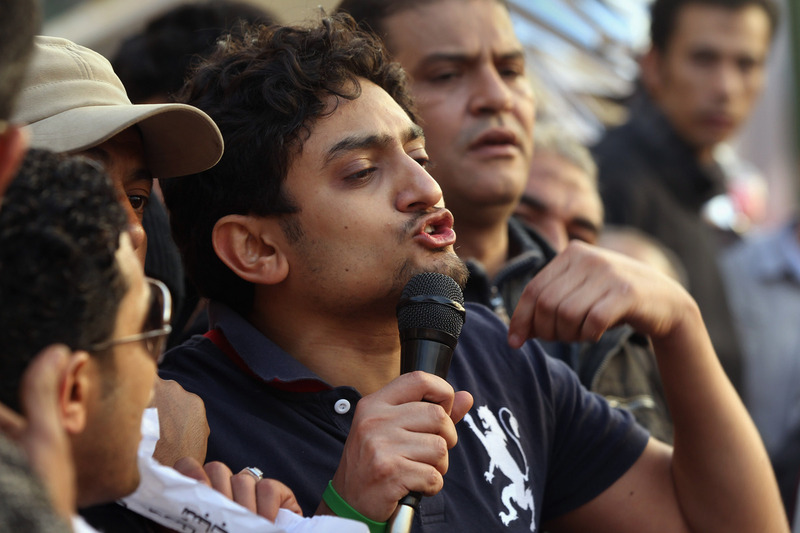 Wael Ghonim addressing protesters in Cairo's Tahrir Square on Feb. 8, 2011. He became for many the face of the protesters in Cairo back in February. Now, Google executive Wael Ghonim is on the "2011 Time 100" — the magazine's latest list of the most influential people in the world. Mohamed ElBaradei, a fellow Egyptian and former head of the International Atomic Energy Agency, writes for Time that Ghonim "embodies the youth who constitute the majority of Egyptian society. ... By emphasizing that the regime would listen only when citizens exercised their right of peaceful demonstration and civil disobedience, Wael helped initiate a call for a peaceful revolution." -- WikiLeaks founder Julian Assange. -- Tiger Mother author Amy Chua. -- Rep. Gabrielle Giffords (D-AZ). -- Rep. Paul Ryan (R-WI). -- And, lest we forget, Prince William and Kate Middleton.